I usually don’t talk about politics but this morning I am being bombarded with political ads on the TV. Our networks are out of the Miami area and like everywhere else negative ads are all you see. Everyone claims to be a Washington outsider and claims they are going to change things. Politicians said the same thing since the 1970’s…maybe even the 1870’s. These outsiders get to Washington, pick a side, tow the line and worry about reelection. Health Care…we have universal health care in Costa Rica and it works ok. If you don’t have money you can go to the public clinics and get free medical care. If you have money you can go to the private clinics and hospitals and pay reasonable prices for medical care. Example..I split my head open and had to go to the emergency room, they helped me right away, they did a good job with the stitches, they were nice and the whole thing with a prescription cost me $50. At the dentist…it’s $25 to get your teeth cleaned and $25 for a cavity filled. Employment… Lots of manufacturing jobs have gone overseas the past 20 years. Not many things say “made in America” anymore..clothing, electronics, cars, toys, shoes…even food. People overseas need us to buy their goods but it has become too lopsided…we need to start buying more American made products even if they cost a little more. A group of 3 guys went out with the 36′ express for a full day of inshore fishing. The guys said the had good weather and good action. They were setting their own hooks and they landed some roosterfish and some jack. One angler said he missed 10 bites and the other 2 guys missed more than 10 bites. They bought a few lobsters from a local fisherman and ended the day with lobster and cold beers at the Hook Up Bar and Grill in Los Suenos resort…sounds like a good day. The past few days have been mostly cloudy but with just a light drizzle and no wind to speak of…today that changed. It was decent early in the morning but by noon it opened up and we had heavy rains and strong winds until about midnight. The group that went offshore today on the 42′ custom said it was rainy with 5 ft seas. They caught 5 mahi and said they could have caught 20. They released a sailfish, raised 3 marlin…hooked one but it broke off…not horrible fishing considering the conditions. Any time you hook or even see a marlin it’s a special day…I don’t care if it’s the only fish you saw all day. Almost every captain down here will trade 20 sailfish for one marlin. That same group is doing a full day inshore tomorrow hoping for a trophy roosterfish…hopefully the water isn’t too muddy. The guys on the 36′ express were out there in the rain also and they caught a black marlin…I know they caught some mahi mahi also but no one talks about mahi mahi if they catch a marlin. For the past 2 weeks we have been having phone problems in Costa Rica. The majority of calls are going through but some people are having problems with dropped calls and static. I am trying to track down the problem but the people in CR say its a problem in the USA and the people in the USA say its a problem in CR…go figure. If you can’t get through try my magic jack number at 1-85-SAILFISH or my SKYPE bubbacr or my AOL Instant Messenger gotobubba or just send an email to help@costaricafishingreport.com. There were a couple boats out fishing in front of Los Suenos today. The 60 ft convert in Los Suenos went out and caught a couple sailfish and a mahi mahi. They started at the craters and finished at the corner. The guys on the 43′ convert in Los Suenos fished just inside the corner…about 25 ish miles out and a caught a couple striped marlin. There was a private boat that went out and got skunkered…that doesn’t happen very often down here. One of the private boats fished recently down near Cano Island and caught 6 striped marlin and a blue. I talked to the guy fishing tarpon on the Caribbean side and he had 3 nice tarpon on a short day of fishing. He caught 2 on circle hook and sardine and one on a big jig. It’s still high season for weather and tarpon on the Caribbean side. I talked to an angler yesterday that reported some gray skies and light rain but not too bad. He said there was lots of tarpon rolling and ended the day with numerous hook ups and 3 tarpon releases. 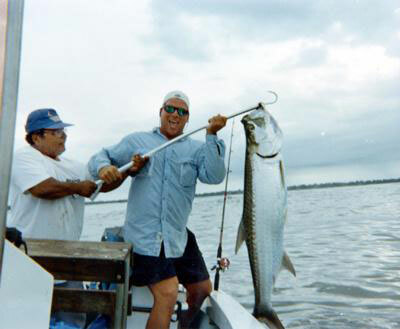 He had one fish that spooled all the 20 pound test of his reel…big tarpon…little tarpon & big shark…over there you never know. The fishing on the Pacific side has been a little slow the last few days. I heard a few sailfish and small mahi here and there and some marlin sightings. As the weather improves over the next couple weeks so will the water quality and so will the bite. Sorry for the lack of reports the past week…not many boats fishing and I have been finishing up my move. It is so nice to be 5 minutes from the marina, tackle stores and the only grocery store in Costa Rica with Dr Pepper and Mountain Dew. My gas cost now are $20 a week instead of $20 per day and I have not had to go through a road block yet. The traffic police around here at times have 2 or 3 rode blocks set up around town. Sometimes they wave you through and some times they stop you and check if you are all legal. In the past if you were not legal then you either got a ticket or paid some “chorizo” or “grease” to get back on the road. More and more they are following the rules…I miss the old days. The guys on the 33′ express in Los Suenos just put in a pair of new motors and went out fishing today today to test their motors. They went out to the craters…raised 2 sail… released one and then came home. They were back in by 11am…the captain said it was rainy with 3 to 5 ft waves so they came home. The tarpon bite on the Caribbean coast continues to be steady…lots of tarpon around and anglers getting 3 or 4 releases per day. My tarpon guide invited me over for next week…hopefully I can get away for a couple day. We are still having normal weather for rainy season but much better weather than Octobers of past. We have had mostly sunny days with mainly evening showers. I am still a little behind on emails…so this weekend is work, watch some football and maybe sneak down to the river mouth around sunset for some snook fishing. The 60 conv. went offshore with a group today. The captain said the went 3 for 7 on sailfish, they missed a blue marlin and the caught a couple mahi over 30 pounds. He said the water is looking better each day. After 2 long days I did get moved in to my new place and do have internet…I hope to get caught up on emails today..I apologize for the delay but moving is a drag. The 35′ Express in Los Suenos went out by the craters yesterday and raised 3 sailfish and caught 3 tuna in the 30 to 40 pound range. The weather is still very nice for October…sunny and warm during the day with just a few evening showers. You are currently browsing the Costa Rica Fishing Reports blog archives for October, 2010.